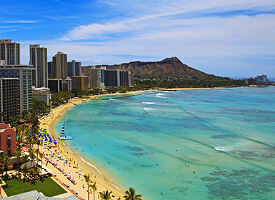 Cruises depart from Honolulu year-round. Cruise ships visiting Oahu, HI dock at the cosmopolitan city of Honolulu. For those seeking sun and fun, snorkeling and diving tours are offered, and Waikiki is just a short taxi ride from the port. The best excursions include a visit to the USS Arizona Memorial at Pearl Harbor and Punchbowl Crater. Tourists also enjoy the sunset hula show at Halekulani Hotel. The Port of Honolulu at the Aloha Tower Marketplace is located about 5 miles from the Honolulu International Airport. Approximate travel time is 10-15 minutes. From the airport, turn right at North Nimitz Highway and travel 4.4 miles. Then, bear right at South Nimitz Highway and travel 0.2 miles. Turn right at Fort Street, then left at Aloha Tower Drive. There is no parking information available at this time. Norwegian sailings will depart from the Pier 2 Cruise Terminal. Driving from Honolulu International Airport to Pier 2: Start out going north on Rodgers Blvd. toward N. Nimitz Highway for .1 miles. Turn right onto HI-92 N. Nimitz Highway and travel 5 miles. Nimitz Highway becomes Ala Moana Blvd. Turn right on Channel Street. Once on Channel Street, the cruise terminal is on the right-hand side. Driving from Waikiki to Pier 2: Travel on Ala Wai Boulevard heading west. Turn left on Highway 92 (Ala Moana Blvd. merging into Nimitz Highway). Turn left on Channel Street. Once on Channel Street, the cruise terminal is on the right-hand side.